The examples that I recently saw in Toledo of the Castile-La Mancha flag were in the usual Spanish proportions of 2:3 and had the same vermillion shade of red as the flag of Madrid city. The local flags of Toledo that I saw (see these somewhat dark photos) were very purplish (reddish purple, or perhaps violet) (...). The flags of Castile-La Mancha had this same purplish color. (...) I understand that the law regarding the flag describes the color as rojo carmesí (crimson red, quoted from the S.E.V. website), I am just reporting what I saw. Is this an error, or a local practice in Toledo, or the proper color? It seems to me to be close to the heraldic purpure. 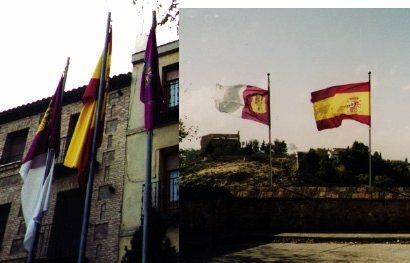 The General Department of the Local Administration (Dirección General de Administración Local), which depends on the Council for Public Administrations (Consejería de Administraciones Públicas) has approved since 1984 grants for 481 municipal flags and arms in Castile-La Mancha. Since the beginning of 2005, the highest number of granted flags and arms is 12, in the province of Cuenca, to the towns of Cañaveras, Casas de Garcimolina, Arcos de la Sierra, Huelves, Pozorrubio de Santiago, Tébar, San Lorenzo de la Parrilla, Buenache de Alarcón, Buenache de la Sierra, Villalba de la Sierra, Palomera and Huerta de la Obispalía. 6 flags and arms have been granted in the province of Toledo, to Numancia de la Sagra, Illescas, El Romeral, Villarrubia de Santiago, Sotillo de las Palomas and Cervera de los Montes. Only 3 flags have been granted in the province of Ciudad Real, to Llanos del Caudillo, Las Labores and Socuéllamos. In the province of Albacete, the town of Navas de Jonquera was the only one to have been granted a flag and arms. Therefore, the total numbers of municipal flags and arms granted in Castile-La Manca since the beginning of 2005 is 31. The law states that the first step for the grant of a flag and arms is the approval of a motion by a part of the relevant Alcadia, in a technical and heraldic manner. Then the approval must be confirmed in a plenary session by the Consistorio and published in the Official Provincial Gazette. Twenty days after publication, the proposed symbols must be definitively approved by the Pleno municipal. (I cannot say accurately what are the Alcadia, the Consistorio and the Pleno municipal; I guess that the latter is the Municipal Council.) Then the request is sent to the General Department of the Local Administration, which forwards it to the Royal Academy of History (Real Academia de la Historia) for approval. Finally, the Council for Public Administrations shall approve the emblems through an order (Orden) to be published in the Official Gazette, which is the last step of the validation process. For the moment, the FOTW website shows only the municipal flags of Guadalajara and Toledo. 479 flags to go! Source: "Terra Actualidad – Vocento/VMT"
According to "La Verdad Digital," the General Directorate of Local Administration (Dirección General de Administración Local), which depends on the Council of the Public Administrations (Consejería de Administraciones Públicas) has approved since 1984 the grant of 490 flags and coats of arms to municipalities (ayuntamientos) in Castile-La Mancha. The grants might include the flag and the coat of arms or only one of the two elements. Arcos de la Sierra, Buenache de Alarcón, Buenache de la Sierra, Cañaveras, Cardenete, Casas de Garcimolina, Casasimarro, Los Hinojosos, Huelves, Huerta de la Obispalía, Ledaña, Palomera, Pozorrubio de Santiago, San Lorenzo de la Parrilla, Tébar, Villalba de la Sierra and Villora. Orea, Fuentelencina, Corduente, Matillas, Almoguera, El Recuenco, Taragudo, Loranca de Tajuña, Tórtola de Henares and Alcoroches. Numancia de la Sagra, Illescas, El Romeral, Villarrubia de Santiago, Escalona, Los Yébenes, Sotillo de las Palomas and Cervera de los Montes. Membrilla, Llanos del Caudillo, Las Labores and Socuéllamos. The FOTW website shows only 20 municipal flags in Castile-La Manca, which means that we still have 470 emblems to find.